Benvenuta was the last of seven daughters. Her parents, too, must have been amazing people in comparison with so many in our time. When the silence of the midwife proclaimed that her father had been disappointed once again in his desire for a son, he exclaimed, “She too shall be welcome!” Remembering this she was christened by her parents Benvenuta (“welcome”), although they had asked for a son. A vain older sister unsuccessfully tried to teach the pious little Benvenuta to dress in rich clothing and use the deceits of society. Benvenuta hid from such temptations in the church where she developed a tender devotion to the Blessed Virgin. By the age of 12, Benvenuta was wearing hairshirts and a rope girdle. As she grew the rope became embedded in her flesh. When she realized the rope must be removed, she couldn’t get it off, so she prayed and it fell to her feet. For this reason she is often pictured in art holding a length of rope in her hands. Having become a Dominican tertiary at an early age, she added the penances practiced by the sisters to those she had appropriated for herself. All her disciplines, fasting, and lack of sleep soon caused her health to fail and she was confined to bed for five years. Thereafter, she was too weak to walk, so a kind older sibling carried her to church once a week for Compline (Night Prayer) in the Dominican church, her favorite liturgy after the Mass. After evening prayer on the Vigil of the Feast of Saint Dominic, Dominic and Saint Peter Martyr appeared to Benvenuta. Dominic had a surprise for her. The prior was absent at the Salve procession, but at the beginning of Compline she saw Dominic in the prior’s place. He passed from brother to brother giving the kiss of peace, then went to his own altar and disappeared. At the Salve procession, the Blessed Virgin herself came down the aisle, blessing the fathers while holding the Infant Jesus in her arms. 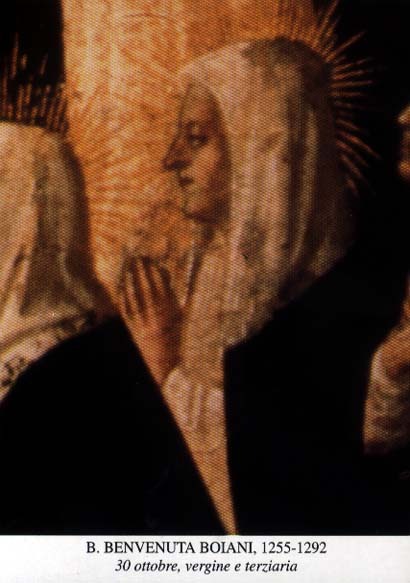 Benvenuta spent her whole life at home in Cividale busy with her domestic duties, praying, and working miracles. She was often attacked by the devil, who sometimes left her close to discouragement and exhaustion. When someone protested against the death of a promising young child, Benvenuta commented, “It is much better to be young in paradise than to be old in hell.” The devil often appeared to her in horrifying forms but was banished when Benvenuta called upon the Virgin. Benvenuta’s companions called her “the sweetest and most spiritual of contemplatives, so lovable in her holiness that her touch and presence inspired gladness and drove away temptations.” This is amazing in light of the severe penances that she imposed upon herself–and another sign of blessedness that she didn’t judge others by her standards for herself (Benedictines, Dorcy).